This quilt has been an embarrassingly long time in the making. I graduated from high school in 2005 and lugged around a box of t-shirts for more than ten years before finally finishing this! 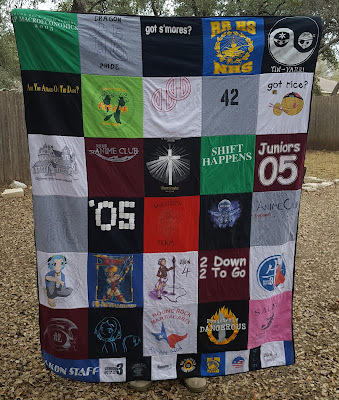 I did try to start on it (and cut down on my clutter) back in 2009 or so by cutting out the fronts and backs of all the t-shirts into 12x12 squares....and that was a terrible decision! I didn't immediately apply interfacing to the backs when I went back to work on this project, the edges of the t-shirt had curled up and were impossible to work with, so I had to trim them all down to 11.5x11.5. It was very frustrating! And since I'm now trying to tackle my box of college t-shirts and having the same problem with the curling edges, I again will remind you: INTERFACE THE T-SHIRTS AS SOON AS YOU CUT THEM.It's annoying because it takes a TON of interfacing and it can get expensive, but it's definitely a must. The basics are cut out your design, iron it onto some lightweight interfacing, then sew the panels together like large quilt blocks. I chose to use a single large piece of fleece to back my quilt instead of doing a traditional layer of batting and then cotton backing because t-shirt material is pretty heavy and warm already, and I live in Texas. It also made the quilt thinner and easier to quilt on my regular home sewing machine. Yeah, it ended up being about queen sized and I stuffed that thing through the whole in my singer! I wasn't sure I'd be able to do it, but I managed. The hardest part of this project for a beginner is working with t-shirt material. Jersey knit is stretchy, and stretchy material is hard to cut into uniform pieces, hard to sew without accidentally stretching out the seams, and as I found out the hard way, curls up at the edges over time. To help with those things I used a large square 12x12 quilting ruler when cutting out my t-shirt pieces and of course used interfacing on the backs of each block of fabric. Next time I will interface my pieces either before cutting them or immediately after cutting them. Youtube is full of t-shirt quilt tutorials though, so look around if you're thinking of making one!